BankIntroductions.com, a Canadian company that specializes in global banking strategies and currency consulting, is advising clients that the amero may be the currency of North America within the next 10 years. “Implementation of the amero currency may actually give Mexico an economic boost, thus helping to alleviate Mexican immigration pressures into the United States for those Mexicans seeking financial gain,” BankIntroductions.com advises. As WND reported, coin designer Daniel Carr has issued for sale a series of private-issue fantasy pattern amero coins that have drawn attention on the Internet. The Council on Foreign Relations also has supported regional and global currencies designed to replace nationally issued currencies. In an article in the May/June issue of Foreign Affairs, entitled “The End of National Currency,” CFR economist Benn Steil asserted the dollar is a temporary currency. Previs told the television audience many Canadians are “upset” about the amero. Most Americans outside of Texas largely are unaware of the amero or the plans to integrate North America, Previs observed, claiming many are just “putting their head in the sand” over the plans. At the same time, the Chinese central bank set the yuan at 7.0402 per dollar, the highest level since Beijing established a new currency exchange system in 2005 that severed China’s previous policy of tying the value of the yuan to the U.S. dollar. Many analysts worldwide attributed the dramatic fall in the value of the U.S. dollar at least partially to China’s announcement last week that it would seek to diversify its foreign exchange currency holdings away from the U.S. dollar. China recently has crossed the threshold of holding $1 trillion in U.S. dollar foreign-exchange reserves, surpassing Japan as the largest holder in the world. Barry Ritholtz, chief market strategist for Ritholtz Research & Analytics in New York City, in a phone interview with WND, characterized today’s downward move of the dollar as “wackage,” a new word he coined to convey that the dollar is being “whacked” in this current market movement. “The future should be focused on exporting to China,” Guiterrez told reporters in Bejing, noting that this year, U.S. exports to China are up 34 percent on a year-to-year basis, surpassing last year’s gain of 20 percent. THE PEOPLE’s Republic of China, long lauded by America’s enemies as the world’s next economic power, will be the country that will force the creation of the `North American Union’ (NAU). Kofi Annan’s former pointman, Canadian Maurice Strong, has been boasting from Chinese soil that China soon would be replacing America as economic king, using the jingo that’s the official language at Turtle Bay. The billions of dollars China has invested in the flagging American economy will be worthless. They will have to negotiate the exchange rate to the new amero. This will then force the creation of the North American Union. The cloak of the NAU, fashioned in secrecy, will be thrown over an unsuspecting public, erasing the borders of three countries. Mexico, which already has legions of its citizens living and working inside America, is, in effect already inside the NAU. Their governments will inform the American and Canadian people that there is no option but the bread line. Unfortunately, the plan, which has been in place for some time, now, has been all but ignored by the mainstream media. One of the signs that the NAU is on its way is the collapse of the American greenback dollar paving the way for the debut of the ‘amero’. “Two analysts who have reconstructed money supply data after the Fed stopped publishing it argue a coming dollar collapse will set the stage for creating the amero as a North American currency to replace the dollar,” (WorldNetDaily, Dec. 13, 2006). The euro followed the same blueprint of stealth and surprise. It was already issued as replacement currency before the masses could coalesce to fight it. Who ever would have dreamed that the euro of a secular bureaucracy one day would be accepted for use at the Vatican? Pope John Paul II, who repeatedly condemned the “moral drift” of secular Brussels, sanctioned an official Euro for the Vatican. 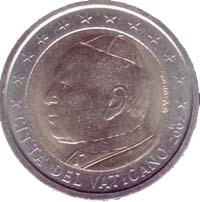 “By permitting his image on this new coin, John Paul II has given another symbolic and powerful stimulus to the European Union, which with the issuance of the Euro, is taking an important step towards the Universal Republic,” said Atila Sinke Guimarnes in Daily Catholic. Was it all that long ago when people said the formation of the European Union was impossible? Today, the EU European holds 27 nations under its authority with other countries lined up for membership. In the US, experts are now predicting that the collapse of the dollar is imminent. While the amero is being groomed to enter stage left, another phenomenon has been gathering steam outside of media headlines. The North American Union, which got its start in secrecy, has been pulled out of the closet by a grass-roots effort, that will force it onto the agenda when Nancy Pelosi and Company open the 100th congress next month. Pressed on by Conservative Caucus Chairman Howard Phillips; WND columnist and author Jerome Corsi; activist and American icon Phyllis Schlafly, leaders of the 50-member strong coalition are poised to halt any effort by the U.S. to enter into a North American Union with Mexico and Canada. Members of Schlafly’s Eagle Forum have been in training for the past two months to lobby on Capitol Hill when Congress convenes. Armed with the Internet release of about 1,000 documents, obtained in a Freedom of Information Act request to the Security ad Prosperity Partnership of North America, the coalition has the potential to embarrass the governments of all three countries. According to Corsi, “the documents show the White House is engaging in collaborative relations with Mexico and Canada–outside the U.S. Constitution. Very little about the NAU has been covered by the Canadian media. The stage has been carefully set and only intervention will stop North America from taking the same stealth route that Europe took in creating the European Union and its legal tender the Euro. ← Barack on ‘Rocky’: fictional!